At times, it becomes very difficult to decide to whom one should support when two parties are squabbling with each other; and it indeed becomes more difficult when two evils are wrangling. This is the current scenario between the most powerful group of media, the Jang group, and the most powerful military institution, Inter-Services Intelligence (ISI). In this article, I will briefly give reasons as to why I called them evil and then give ‘would-be’ motives for escalating this conflict. The history of Jang group shows that it sails according to the time without any specific ideology. Throughout the history, it has been violating the business concept known as Corporate Social Responsibility. It is the group which can go to any length to gain the economic benefits and to curb the business opponents. The group is the backbone in introducing the evil and setting negative trends in the field of journalism from paying a meager salary to exploiting the consumers. Reviewing past of the group past shows, it has been acting, a couple of decades ago, as a sycophant of the sitting governments; and in return, receiving extraordinary favors and advertisements, which helped the group to become the largest publishing house in Pakistan. 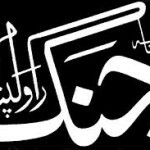 The owner of the Jang group has appreciated well the changes in the trend since the late 90s, after arrival of the electronic media in which it has become imperative to criticize, rightly or wrongly, the sitting government in order to improve rating of the newspapers and TV channels. Seeing the new trend, the group changed its policy which it followed for decades. Similarly, the shift can clearly be seen in relation to India. The group was extremely hostile towards India until it initiated the so called movement of ‘Aman ki Aasha‘ (Desire of peace). According to the critics, they leaned towards India to the objectionable level under the so called movement. The ‘Amen ki Aasha’ bears very little influence on the Indian society and media; they are as hostile as before towards Pakistan. In contrast, the owner of the media house started to promote Indian values in Pakistan through promoting their product such as films, drama and other shows (mind it, now this is not only restricted to the Jang group or Geo television, all are doing the same, now). According to the group, the group took the consent of the government and the army before initiating the movement ‘Amen ki Aasha’. It seems that the claim of getting consent from the institutions is correct since no one has denied the report, so far. As mentioned above, the group has historically cordial relationship with public institutions including the army. The problem started when they assumed that it is the only media house that can make or break the government. And, this confidence may be developed due to the successful lawyers’ movement against the Musharraf’s regime (though the Jang was not the only media house who supported the movement). Due to this over superfluous estimation of their power, they tilted towards Nawaz’ government and showed hostility towards the powerful military organization, which led to the current quarrel. The military is another evil and white elephant of the society. Except capturing Islamabad, time to time, they have little in pocket to show their success on any front. They have lost all the wars and despite ruling Pakistan several times, they unable to eradicate corruption. Contrary to eradicating corruption, they have looted the wealth of the nation through institutionalized and informal methods of corruption. The level of corruption by no means less than civilian institutions or politicians; however, propaganda mostly goes against civilians. Whenever they are not directly in power, they get involved in conspiracies against civil leaders. They have been accused of killing thousands of people, abducting individuals and manipulating election results. Since the lawyers’ movement, the military top brass apprehensions are that they have been losing the grip on political affairs. When Musharraf’s rule came to an end, the military could not play the game of political musical chair between PPP and PMLN, though they had tried hard to upset the Zardari’s regime but could not get success due to clever moves of Zardari. During the Zardari period, the judiciary and the Jang group provided partial support to the army; the judiciary had been accepting reasonable and unreasonable petitions against Zardari’s government on a daily basis, and the Jang group kept predicting throughout the tenure that the government would be toppled down within 6 to 12 months. However, the actions and reactions of the judiciary and the Jang group have considerably changed since the Nawaz’ party took the power. Of course, this raised alarm bells in the houses of the army. As mentioned above, this time, Nawaz developed some understanding with the Jang group instead of following the animosity of the 90s (Nawaz never had a so good relationship with the Jang group in 90s when he was in power), but he did not change much his stance towards the army. The army got more sensitive regarding their declining political power when they failed to clear the name of Gen. Musharraf from ECL, so that he could leave the country without facing the trails, including the charges of high treason and subverting the constitution. They have been playing various dirty tricks and using medical grounds to avoid his appearance in the court. They have, indeed, planted anchors in different channels to speak in favor of the golden days of army rule, which was not sufficient unless they show their muscles. To show muscles to the hostile judiciary, Nawaz government and various other channels, they moved directly against the Jang. 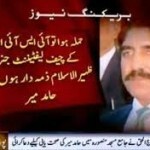 The telecast of the news regarding ISI involvement in the attack of Hamid Mir (Geo anchor and the Jang columnist) was taken as the opportunity to show the supremacy of the military. The day the news telecasted, the planted anchors, for example Mubshar Luqman of ARY and commentators made it an issue, forthwith. They made a huge hue and cry and squabbled as to why GEO TV showed a photograph of the Director General of ISI, Lieutenant-General Zaheer Islam, while reporting the attack on Hamid Mir. Indubitably, there was nothing wrong in showing the photograph with the news as it has been the practice in Pakistani news channels; all TV channels have always showed picture of the person(s) while running negative news whether it is Nawaz, Zardari or any political figure or a civil bureaucrat, nevertheless, this time it was turned into an issue as the security of the state was attacked. Interestingly, those anchor persons who took the issue as a routine material for talk-shows changed their stance in the later days and joined the controversy to favor the army. Overnight, ISI, which has been the center of criticism in talk-shows became as the symbol of virtuousness. Small groups and insignificant political parties started to hold rallies in favor of the army demanding ban on the Geo channel(s). During the rift of the Jang group and the army, a surprise came from Imran Khan of Tehrik-e-Insaaf, who accused the GEO and the ex-Chief Justice Iftikhar Chadhary for being a party in rigging the elections 2013. He also charged the channel for accepting money to run an Indian agenda in the country. Imran has never levied these charges against the Jang group and the ex-Chief Justice prior to this theater. Whether or not it is true, the suspicions are that Imran Khan did it at the behest of the army. To gain further sympathies of the pubic, religion once again exploited. A few days after the first episode, Mubshar Luqman, once again, accused the GEO channel for blasphemy for showing a Qawali (a kind of religious song) in which a newly celebrity couple was invited. Nevertheless, the same type of program was telecasted on ARY where Mubshar Luman was working, ironically no one criticized (It might be in the interest of readers that Mubashar Luqman served in the military regime of Gen. Musharraf and considered a close ally of the military). After this incident, a number of cases filed against the owner of the group. Of course, under the immense pressure, they have tendered the unconditional apology to the army, which yet to be accepted. The fact is that the case has not been built only against the Jang group, but to control the media, especially electronic. Likewise the reason of bringing ex-chief justice in the current picture has again not been to criticize Iftikhar Chaudhry, but to weaken the power of the judiciary. It appears that some of the goals army has already achieved: the Jang group has tendered their apology and most columnists who were aggressive to the role of ISI are apologetic. The news in the daily express news is (01.06.2014) that the government has been agreed to remove the Musharraf name from the ECL. If the army has met their goals is yet to be seen. Apparently, it seems that it will not stop here. Tahir-ul Qadri and Ch.Sujjat Hussain have also called into the picture to form an alliance against the Nawaz government. It is very likely that Imran will head this alliance. The fact is that all those who are making this non-issue into a real issue has their own vested interests without realizing that they (excluding the army) might not be the ultimate winner of the game. Imran Khan might have temporarily got some assurances in the game, but it is very likely that he would be ignored when army wins as it happened to Asghar Khan in 1977.